In a large bowl, stir together cookie mixes, flour, eggs, butter, almond extract, and milk until a stiff dough forms. On a lightly floured surface, roll dough to ¼ inch thickness. Using a 5 inch cookie cutter, cut out cookies. Place on unreleased baking sheets. 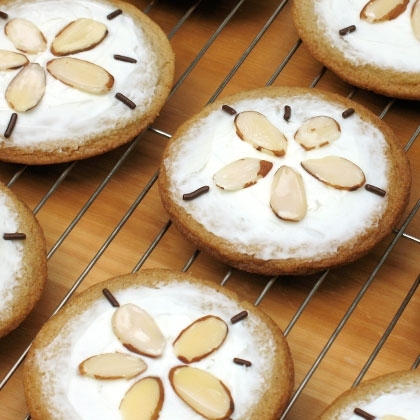 Gently press 5 almonds into each dough round in a spoke pattern to resemble a sand dollar. Bake for 7 to 9 minutes, or until edges are light golden brown. Let cool on pans for 1 minutes. Remove to wire racks to cool completely (about 1 hour). End.